Last update issued on October 26, 2003 at 03:20 UTC. Last minor update posted at 19:18 UTC. The geomagnetic field was quiet to active on October 25. Solar wind speed ranged between 441 and 615 km/sec. Solar flux measured at 20h UTC on 2.8 GHz was 221.5. The planetary A index was 14 (STAR Ap - based on the mean of three hour interval ap indices: 15.4). Three hour interval K indices: 33224433 (planetary), 43214332 (Boulder). At midnight there were 5 spotted regions on the visible disk. Solar flare activity was moderate. A total of 13 C and 3 M class events was recorded during the day. A C2.8 flare at 03:52, a C3.9 flare at 08:12 and a C3.2 flare at 19:33 were optically uncorrelated. Region 10484 decayed further in the northeast section. The region became more compact in the central part. The large opposite polarity umbrae in the west converged causing increased magnetic shear in this area. 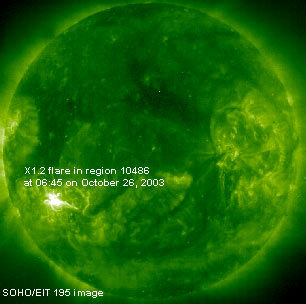 With an increase in flare potential an X class flare is becoming more likely. Flares: C2.6 at 03:00, C3.9 at 03:41, M1.7 at 05:53, M1.5 at 10:35 and C4.2 at 14:52 UTC. Region 10486 developed, particularly in the southern and in the central parts where penumbral area increased. Major flares are likely. Flares: C4.3 at 02:06, C3.4 at 03:56, M1.2/1N long duration event peaking at 04:46, C3.4 at 09:49, C3.4 at 11:28, C2.4 at 18:04, C3.3 at 20:32 and C7.9 at 22:31 UTC. New region 10487 rotated partly into view at the northeast limb on October 24 and was numbered the next day by SEC. There appears to be no separation between the leading positive polarity area and the trailing negative area. A minor M class flare is possible. [S286] A new region emerged in the southeast quadrant to the northeast of region 10486 on October 24. Slow development was observed on October 25. Location at midnight: S12E50. [S288] A new region emerged to the northwest of region 10486 on October 25. Location at midnight: S12E31. Comment added at 06:59 UTC on October 26: Region 10486 produced a major long duration X1.2 event peaking at 06:48 UTC. Both type II and IV radio sweeps were recorded and the flare is likely to have been associated with a large and very fast CME. 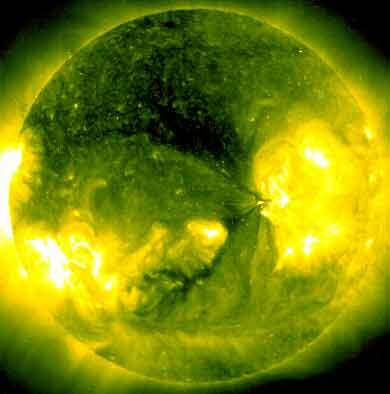 The CME could impact Earth on October 27 and cause a severe geomagnetic storm. Comment added at 18:02 UTC: Region 10484 is the source of a long duration X class event currently in progress. At this time the flare has reached the X1.2 level, but it has been rising slowly and may be headed for considerably higher levels. This event is almost certain to be accompanied by a large CME. Further details will be posted later on. Prior to this event a large CME was in progress over the northwest quadrant. The X1 flare in region 10486 earlier today was associated with a full halo CME (please note that a west limb prominence eruption was the source of another CME visible at the same time). The CME could impact Earth late on October 27 or on October 28. A new spotted region has emerged in the northeast quadrant. Current location N08E24. A solar wind shock was recorded at SOHO at 07:49 today. The interplanetary magnetic field has been northwards all the time since the CME impact (probably related to an M7 eruption in region 10486 on October 24) and therefore the CME has not yet become geoeffective. Comment added at 19:18 UTC: The X1.2 long duration event in region 10484 was a proton flare. Currently the above 10 MeV proton flux has reached 100 pfu and is still increasing. Yet another solar wind shock appears to have arrived at ACE at 18:30 UTC. The interplanetary magnetic field is still northwards. October 25: No obviously geoeffective CMEs observed. October 24: A full halo CME was observed following an M7 event in region 10486 early in the day. The core of the CME is not heading towards the Earth, however, a minor part of this CME could reach Earth late on October 25 or early on October 26. 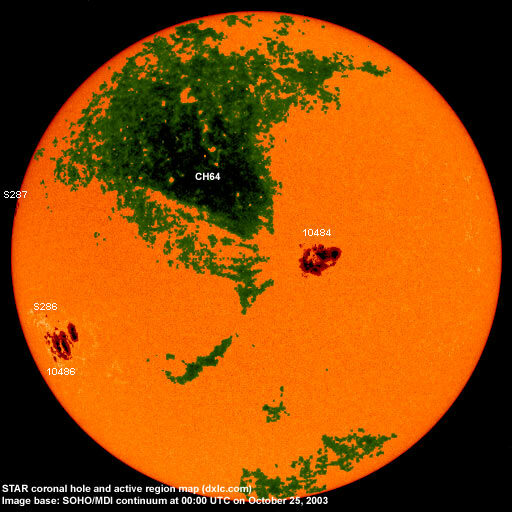 A recurrent coronal hole in the northern hemisphere (CH64) may have been in a geoeffective position on October 25-26. During the previous solar rotation this coronal hole did not cause a geomagnetic disturbance. Processed SOHO/EIT 284 image at 19:06 UTC on October 25. The darkest areas on the solar disk are likely coronal holes. 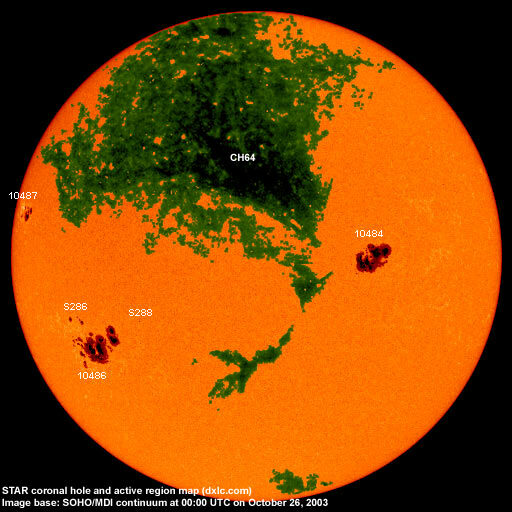 The geomagnetic field is expected to be quiet to minor storm on October 26 and quiet to unsettled on October 27-28. Long distance low frequency (below 2 MHz) propagation along east-west paths over high and upper middle latitudes is very poor. Propagation along north-south paths is poor to fair. [Trans Atlantic propagation conditions are currently monitored every night on 1470 kHz. Dominant station tonight: Radio Cristal del Uruguay. An unidentified station from Argentina was noted as well].